Santa's sick of cookies. At least that's the excuse Store Brand Scorecard's Old Man used every Christmas Eve when it came time to bake a snack for St. Nick. The rationale made sense at the time. Santa's got a lot of houses to go to and a bunch of cookies to eat, so the guy could benefit from at least one treat that cut against the grain. So in our house, we always made fudge brownies. They were Dad's favorite, so if they were good enough for him, they'd be great for Santa Claus. Brownies are a reliable, easy-to-bake treat during a hectic holiday season; crack some eggs, mix some ingredients and away you go. They're particularly popular with college kids too, thanks to an optional, ahem, secret ingredient (which we at Store Brand Scorecard officially won't discuss, although we will say that ingredient really isn't holiday appropriate). In the spirit of our Christmas tradition, Store Brand Scorecard tried out four brands of fudge brownie mix -- one national brand, three store brand varieties -- to see which brownie brand is worth baking for your bucks.All products were purchased in the Chicago area Dec. 11 and 12, so prices are subject to change. Baking times were as instructed. Please note that the nutritional facts below are for the unprepared mix (not all of the brands offered up specific nutritional breakdown when mixed). Bank on the vegetable oil, eggs and (in one case) butter significantly increasing the calories and fat. Taste: Ultra chewy, extra chocolatey, and very moist. It's no surprise that this is, as the box proclaims, "America's Favorite Brownie" (based on Nielsen data from the first half of 2010). Taste: Following instructions, these brownies were far too cake-like for our taste, but regardless, the chocolate flavor was weak. Taste: The serving size and nutritional facts are identical to Market Pantry's, but the instructions called for more time in the oven. Perhaps that made the difference here, as these fudgy brownies were definitely chewier. But we honestly think this mix just made for richer-tasting brownies, although Betty Crocker is still better. Taste: These truffle-inspired brownies are a different beast from the others, incorporating Dutch cocoa, chocolate chips and an entire stick of butter (in place of vegetable oil). The result is a very, very, very rich brownie. Extreme chocaholics will love this batch, thanks in particular to those sweet bursts of chips. We liked it a lot, but the flavor was actually a tad too rich for us. Greatest Value: Target's Market Pantry and Jewel's Market Pantry brand may have been identical in many ways, but in the end Jewel's tasted better. On a value scale of 0 to 10, Market Pantry gets a score of 3 (the low price of $1.14 gives it some brownie points). The costlier, but better, Jewel brand is third with a value score of 5. Trader Joe's is as decadent a brownie as you can buy for $2.99. But Betty Crocker, which got creamed in the au gratin potato match a couple of weeks ago, is ultimately the best tasting brand here, and ultimately the best value. 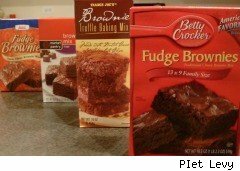 Betty Crocker wins the competition with a value score of 8. Not only is it America's Favorite Brownie, we suspect it may be Santa's too. But Santa would like the costlier Trader Joe's, as well (after all, he's not buying, you are). Just make sure to leave out a glass of milk. Value score for Trader Joe's: 7. Piet Levy's Store Brand Scorecard tests a major label food product and three private label equivalents to see which brand offers the best value for the price. It appears every Monday on WalletPop's Money College page.